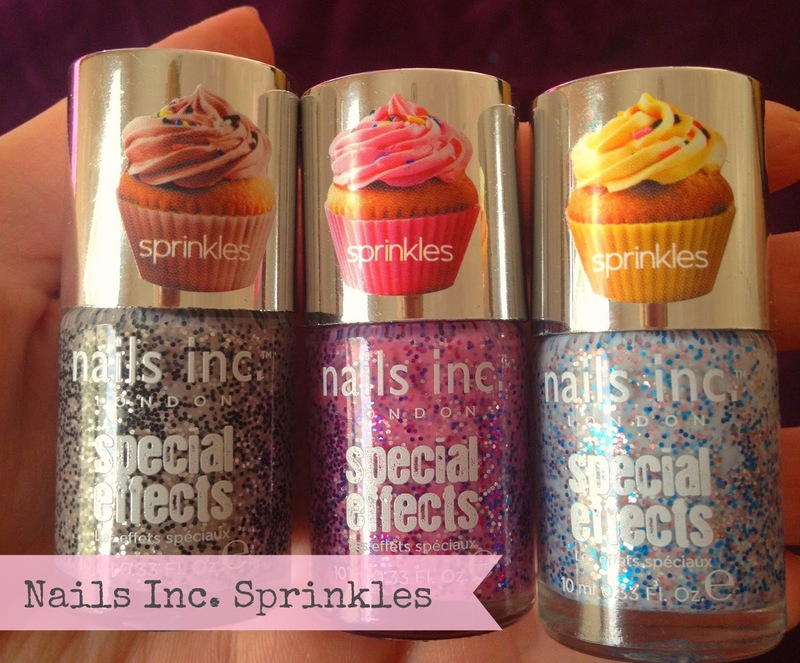 Just recently, I was lucky enough to be asked to review this super cute set of nail polishes by Nails Inc. I had seen these on other blogs and have secretly had my eye on them for a while now. You know me, anything cute and/or food related and I’m there! This ticked both boxes, perfect! The first on my list to test was ‘Sugar House Lane’. 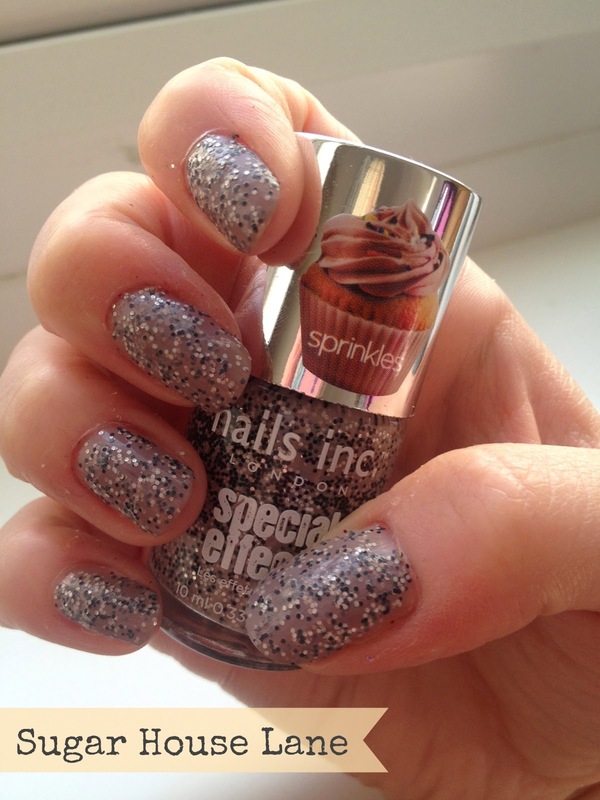 This polish has a taupe base, with black and silver glitter – reminds me of a chocolate cupcake, my favourite! This shade was the most understated of the collection and with the matt finish looked quite stylish. This was my favourite overall of the collection. The next polish to test was the gorgeous ‘Sweets Way’. A very light blue base with pink, blue and white glitter pieces. This shade is super cute and is quite striking. Lots of people noticed me wearing this shade and commented on how unique it was. It reminded me of pure white icing with hundreds and thousands sprinkled on top. Lastly, was ‘Topping Lane’. 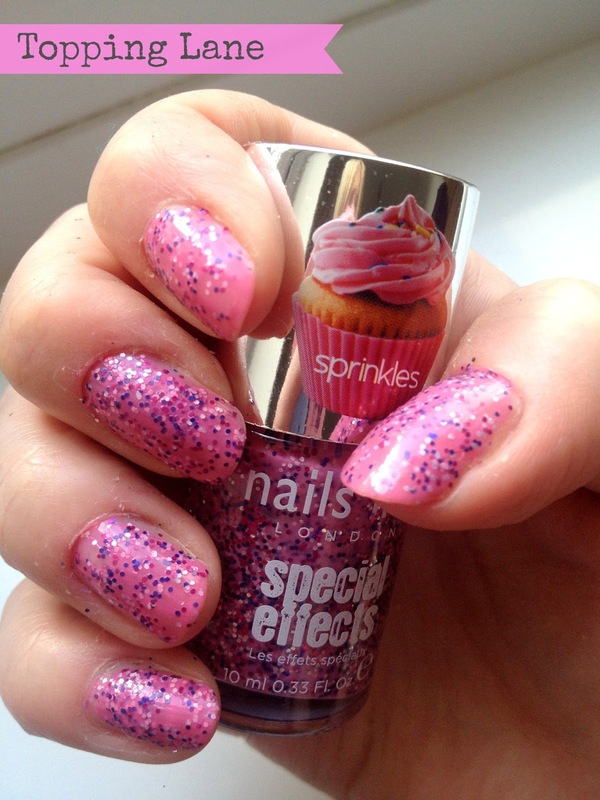 Here we have a very girly candy pink, topped with purple, silver and pink glitter. This shade was a little brighter than I expected and looked a bit too ‘Barbie Pink’ for my liking. I think I would have preferred a slightly toned down baby pink but that is just my personal preference. Reminds me of a very fun, girly coloured cupcake with multi coloured sprinkles. The polish itself was so easy to apply, the glitter pieces spread evenly and dried quickly. As there is a lot of glitter I found I had even coverage after two coats. All of the colours have a matte finish, which I really liked, however you can add a top coat to add a gloss finish if you prefer. The only downside I found with these polishes is they didn’t last very well. After 2 days I had quite a few chips, which was a bit disappointing as I usually find Nails Inc. hardwearing and excellent quality. Overall, this is a really lovely collection. I am really pleased I was able to try them out, and impressed with the unique shades and colours. Wearing these shades has brought lots of comments and compliments from friends and family as they are super cute and unique. These are great for a night out, or adding a fun, different look for an outfit, however are not ideal if you are looking for long standing sustainable colour. You can pick up this collection from QVC at the moment, for the discounted price of £19.68. QVC also offer a large range of nail polishes from different brands at great prices, check this out here. What do you think to these polishes? 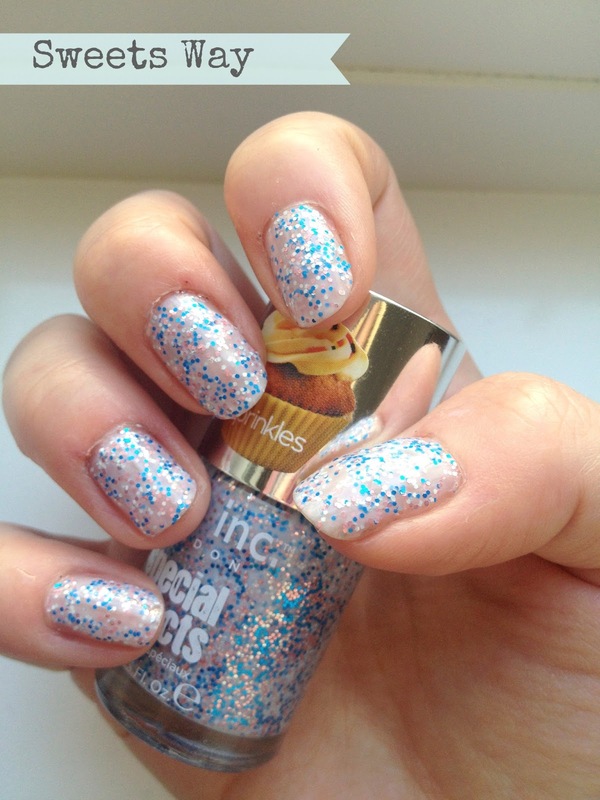 Would you try the Cupcake Sprinkles range?